In what is quite probably the biggest haul of northern carp ever, Kyle Raper bagged a barely believable two 50s, two 40s, two 30s and two 20s in two days. The mindblowing session took place at Eric’s Willows Lake – an open-access booking-on venue – near Leeds. With a hint of understatement, the local angler described it as “a great session, and one I will remember for a long time”. All anglers must pay a £50 one-off joining fee. £30 for 24 hours at weekends. £25 midweek. Winter tickets available. All sessions must be pre-booked. The Sunday-to-Tuesday session including the lake’s biggest fish, Three Scale at 57lb 10oz, the Big Common at 50lb, plus mirrors of 41lb and 40lb. “I arrived at midday on Sunday,” said Kyle. “After a lap of the lake I was informed by other anglers that fish had been seen and caught from pegs 16 and 18. “I initially intended to set up around this area, however, following another lap of the lake, I saw some fish showing in front of peg 11. “I proceeded to act on these sightings and set up. Following a quiet night I fully intended to move swims the following morning. “I lapped the lake again with no success, only to sit back in my original swim and begin to see fish showing in numbers. “I was lucky enough to bag a hat trick Monday night including a 33lb mirror closely followed by a 34lb mirror and a scraper 20. 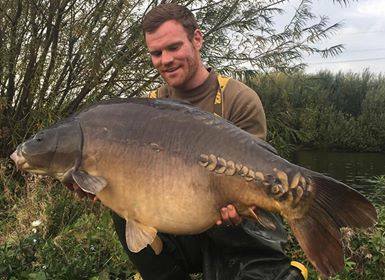 “Once the fish had been returned I was soon called into action again to land a stunning 41lb mirror, followed by Three Scale in the early evening weighing in at 57lb10oz. “I was awoken the next morning with a screaming run that resulted in a 40lb mirror, followed by the big common at 50lb.